Tea has been a favourite drink in the East and West. It is made by pouring boiling water over the cured leaves of the camellia sinensis shrub. Archeological findings have demonstrated that it was drunk by Han dynasty emperors in the second century BCE. Its first documented use was as a medicinal drink in southwest China. During the Tang dynasty it became a popular recreational drink, and its use spread to countries such as Vietnam, Korea and Japan. Portuguese priests and merchants introduced it to Europe in the sixteenth century, and by the seventeenth and eighteenth centuries, it became a fashionable upper class drink in Britain and Europe. As the price of tea fell, its use become more widespread in Britain. The British started large scale production of tea in India in the nineteenth century, to bypass the Chinese monopoly. They were able to grow Chinese species in Darjeeling, but found that a different varietal grew well in the Himalayan region of Assam. The color of tea results from the method and amount of processing that the leaves undergo. There were regional differences in how tea was processed. In general Europeans prefer “black” tea, whereas green tea is the beverage of choice in many Asian countries. Have a Cuppa illustrates the blending of Eastern and Western traditions. There are differences in the types of pots used to brew tea, the type of tea which is drunk, the vessels it is drunk from, and what is added to it. Today in the West we are able to drink black, green or white tea. The British introduced black tea drinking to India, while most other Asian countries continued to drink green tea. 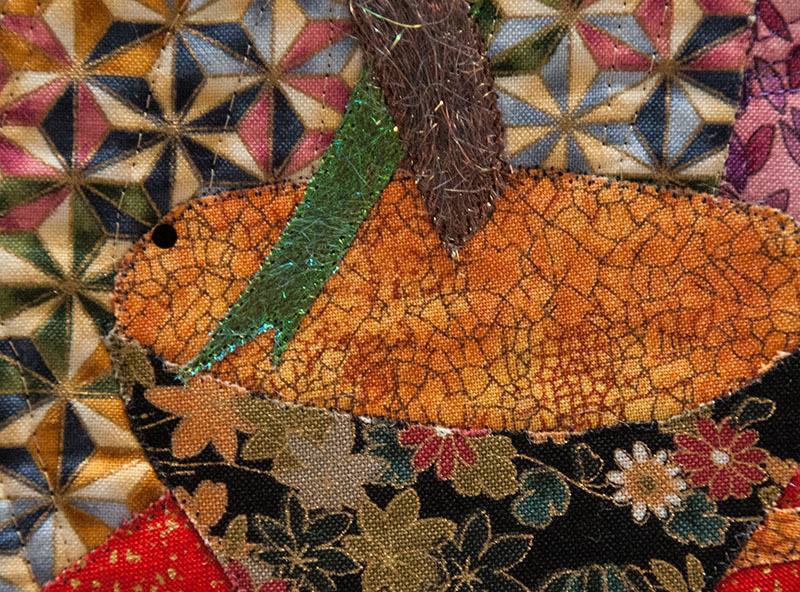 The quilting designs selected for this piece include shippo tsunagi (linked seven treasures) a Japanese yusoko pattern used by courtiers since the Heian era, and Twisted Tartan, a design by Susan Brubaker Knapp. Materials : Commercial screen printed fabrics, Japanese indigo dyed fabric, photo printed sheets, Angelina, cotton batting, silk, cotton and polyester threads. Techniques: Free form curved piecing, photo transfer, machine applique, machine quilting. Have a Cuppa illustrates the blending of Eastern and Western traditions. There are differences in the types of pots used to brew tea, the type of tea which is drunk, the vessels it is drunk from, and what is added to it. Today in the West we are able to drink black, green or white tea. The British introduced black tea drinking to India, while most other Asian countries continued to drink green tea. 🙂 Great minds think alike, eh? I’d like to ‘Have a Cuppa’ with all of you some day! I would love to have a cuppa with you too! Tea just seemed the obvious choice to me—and I am both a tea and coffee drinker. At home we only use loose tea and brew English style. An interesting take on East meets West. Great that something so simple as a cup of tea can inspire lovely art work. I like the idea of green and black tea finishing in the same cup like two cultures mixing together ! Thank you for the tea history. Very nice piece. I have to agree with the other member’s comment well thought out and great design. 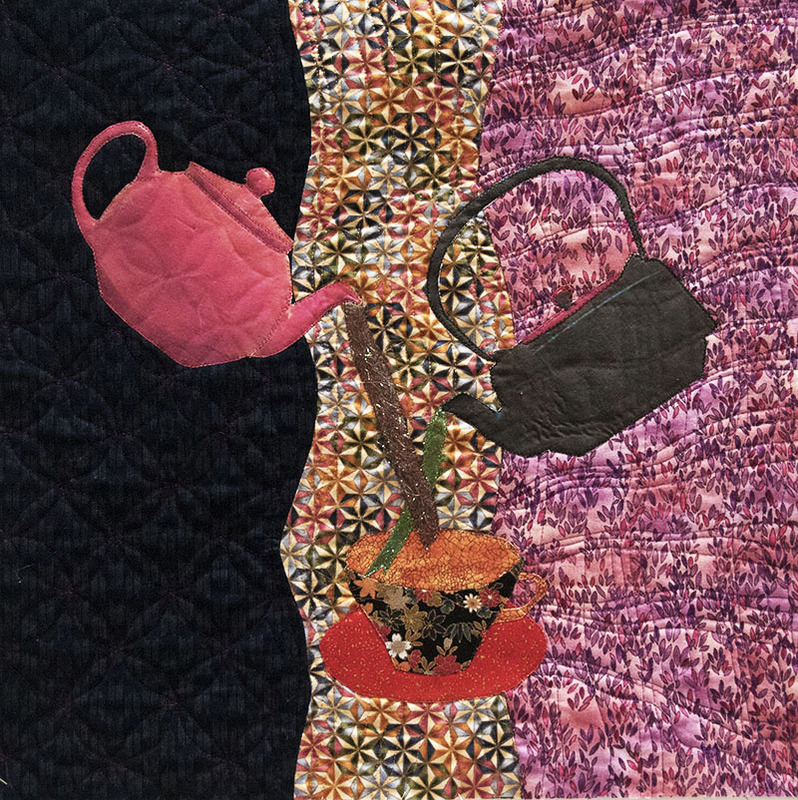 Lovely how you created this quilt with the black and green tea together in one cup. In the past I had a tea and coffee garden and a shop, selling lots of different kinds of tea. Your quilt reminds me on that and on all the different nationalities from the tourists that drank a cup of tea with me. Lovely colours and exciting use of fabrics. Me too would like to drink a cup of tea with you! I love the design and the ways in which you’ve used fabrics and stitch to integrate the tea experience. Great piece. Have a cuppa is a common saying in NZ. The design and use of different fabrics tells the story. A lovely piece.